BIODIVERSIVIST: David Roberts concedes that the progress of wind and solar have been over hyped ...blames television. David Roberts concedes that the progress of wind and solar have been over hyped ...blames television. As in my previous articles, consider this one as a replacement for the missing comment field at Vox. Wind and solar (when not disrupting or displacing intact ecosystems) have a place in our grid, as does nuclear. It's only a matter of how big their respective roles will be. Roberts found a poll that exposes how badly Americans have been misinformed when it comes to the progress of wind and solar. The average American, at least according to this new survey from communications and PR firm Makovsky, has it at 20 percent — 11 percent from solar, 9 percent from wind. That is … quite wrong. In reality, solar is at 1 percent and wind is at 2 percent. Meanwhile, the average American thinks that in five years, solar will be at 20 percent and wind will be at 14 percent. The US Energy Information Administration (EIA) estimates that in five years, solar will still be at 1 percent and wind will have grown to a whopping 3. I don't know where Dave got his numbers (he didn't provide a link), but the 2016 BP statistical review has wind at 4.5% and solar at 0.9% of U.S. electrical energy production for 2015, not that it matters. Could be he's talking about global values instead of U.S. values. Coincidentally, James Conca just wrote a piece at Forbes about a poll showing how Americans ranked nuclear power as the number 1 threat to safety way back in 1987. Both polls demonstrate how vulnerable the general public is to misinformation. 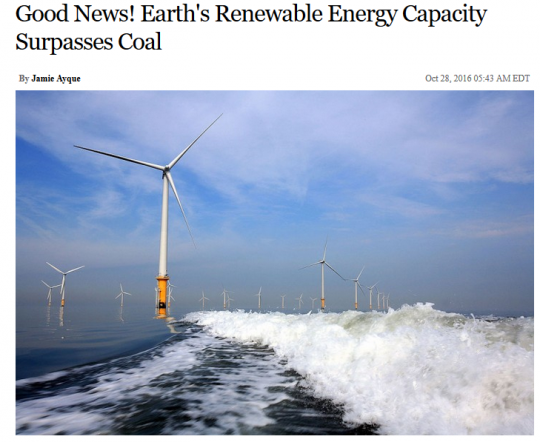 Had David written a piece about the latest IEA renewable energy outlook as I just did, he would very likely have simply passed along the rosy image it projected, like he always has done. A lot of what the general public reads in papers, magazines, on the internet, and hears on NPR, or Fox news, is misleading to say the least. Why they're so inaccurate is a topic for a separate post, or possibly a book. At some level, the public already knows this as the old joke "If it's in the paper, it must be true" attests but that does not prevent false ideas from being implanted. This is what marketing is all about and why we all drive different cars. The next part of David's post serves as an example of his lack of understanding of basic engineering principles. His comment about journalists not grasping "...the difference between electricity and energy" is largely nonsensical. 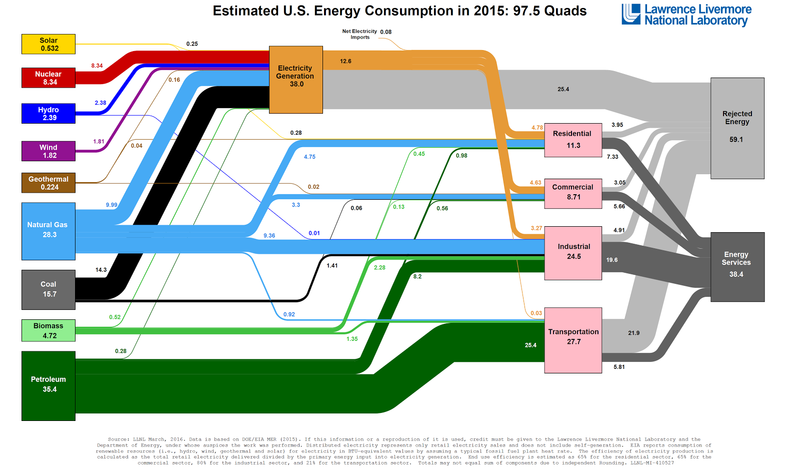 You may have to click on the above chart to read it, but about 12.6 Quads of electrical energy was sold, 28.3 Quads of gas energy, 35.4 Quads of oil energy etc. What I think David was trying to say was that wind and solar impact only the 12.6 Quads of electrical energy sold. They hear about the success of wind and solar and they think "fossil fuels" are being displaced. When they think fossil fuels, they think oil. 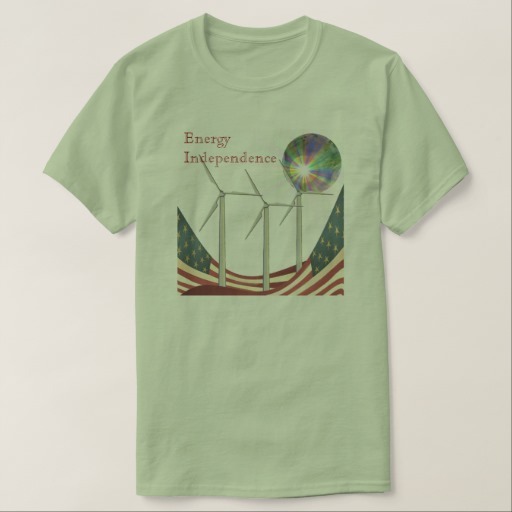 David presents no evidence to support this supposition but I was once given a tee shirt with a picture of a wind turbine on the front along with the words "Energy Independence!" We can present that as anecdotal evidence that at least some people have confused the concept of oil imports with the generation of electricity. But they also know that we make electricity out of coal and natural gas. But wind and solar are only for electricity, so they only displace coal and natural gas. I may be nitpicking here, but wind and solar mostly replace natural gas, which emits a lot less carbon than coal. They replace natural gas because natural gas plants can ramp up and down as solar and wind output ramps up and down. Coal has historically been primarily used for baseload. It's output is mostly steady and does not change as wind and solar ramp up and down. Wind and solar are essentially fuel savings devices for natural gas power stations. Coal is being replaced mostly by natural gas. So, in the end, wind and solar primarily reduce natural gas fuel flows, not fossil fuels burned for heat, industry, and transport (which account for about sixty something percent of fossil fuel consumption) and very little of the coal that is used to make electricity. And if I got that interpretation of what David was trying to convey wrong, well, we'll likely never know because David values his free time too much to use it engaging in debate. And watch for David's usual word switching between clean, renewable, wind, and solar. He's really only talking about wind and solar here. But he'll throw the word renewable in once in a while which includes hydro (which isn't new and has little potential to grow) because it makes the bucket look fuller. The word clean has no definition when David uses it so it is relatively (literally?) meaningless. In my last article I asked the IEA presenter for his definition of clean energy and it included nuclear. The success of clean [whatever that is] electricity has given the US public (and elites!) an exaggerated sense of the success of clean [clean?] energy. This sense of success of clean energy he speaks of, does it include hydroelectric? No. He's only talking about wind and solar here. Wind and solar combined are only about 6% of the 40% of electricity production (94% is not from wind or solar), or, put another way, they are only 2.4% (97.6% not from wind and solar) of total energy. The vast lion's share of decarbonization is attributable to switching from coal to natural gas. This is somewhat unfortunate, as the battle to drive oil and gas out of the transportation and heating sectors is going to be, if anything, more difficult and contentious than the fight to get coal out of electricity. I'd call that a bit of an understatement. Second, I think this reflects a real communications victory on the part of clean energy industries and climate advocates. For years and years now, they’ve been pounding on the message that renewable energy works, that it’s ready, that it’s getting cheap, that it’s growing like crazy. Amen brother! But we already know that renewable energy works. David and I live in a city where over 90% of the electricity comes from salmon destroying, ostensibly renewable, hydroelectric. Because hydro is not getting cheaper or growing like crazy... he must be talking about the less than 6% of renewable that is the combination of wind and solar. So why didn't he just say that? A public that thinks wind and solar together comprise 20% of electricity generation instead of less than 6%, might better be defined as a case of false advertising than a communications victory. David's exhortations are an example of why so many people are comfortable throwing nuclear energy out of the mix. They've been convinced that we won't need it. Repeat that stuff often enough and people will get the idea that fossil fuels are hanging on for dear life — that solar power’s total triumph is nigh. The question is whether it’s a good thing, on balance, for Americans to overestimate wind and solar. It's clearly a bad thing in that it has gone a long way to convince many that nuclear won't be needed. On one hand, nothing succeeds like success. By success does he mean successfully duping the public, or is he calling the fact that less than 6% of our electricity comes from the combined total of wind and solar a success? ...but that tactic also works for selling snake oil. That word "believe" belongs in our churches and political debates, not in our energy debates. This mindset that the truth is irrelevant is often referred to as the end justifying the means, which is standard operating procedure in politics, but will never find the right answer to science and engineering problems, which is what we actually have here. Pundits and politicians can't, and shouldn't, be allowed to design our low carbon grids. The perception of momentum is arguably key to creating momentum. ...said one sheep to the other as they went over the cliff. On the other hand, an overly triumphalist narrative obscures the difficulty and sheer quantity of decarbonization work ahead. It could dampen the sense of urgency that is still very much needed. Riiiight ...sense of urgency. To reduce emissions or fulfill an environmentalist dream of a world powered by wind and solar? Sixty percent of our low carbon energy comes from nuclear yet David has never written a pronuclear article in his entire career. Competition from dirt cheap natural gas is threatening to close some of them. Doesn't worry him at all. Since we know that online news sources like Vox provide only the most sober and judicious coverage of these issues, it seems we can blame this, like so much else, on television. Where do the television writers get their information? Hint ...the internet. Where are the articles David has written hyping wind and solar for the last decade located? Hint ...the internet.